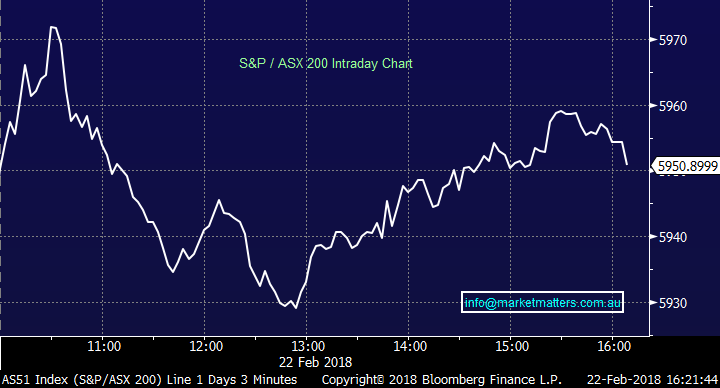 The ASX was strong in early trade today before some selling kicked in and we traded down ~20pts from the highs, however when considering that S&P Futures in the US were trading -0.32% during our afternoon, we fared well in a relative sense. A similar story played out yesterday, and again overnight in our futures market with US weakness failing the inflict pain on local stocks. Seems like a big player may be liquidating US holdings and investing elsewhere, Australia copping some of the flow it would seem! Again, a day of big moves for companies that reported results – more big winners than big losers with a few stocks within our portfolio doing well, Webjet (WEB) which put on 16.04% & Oz Minerals (OZL) which added 5.39% - the two standouts. 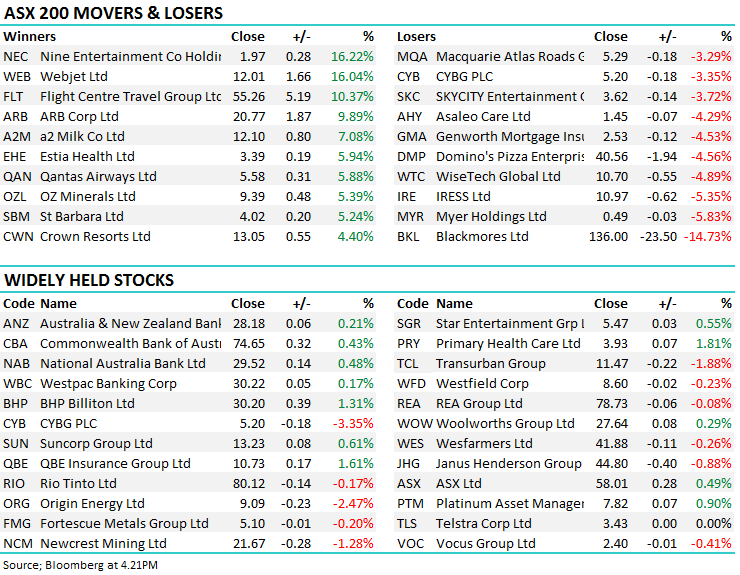 On the broader market, the Consumer Discretionary sector outperformed, adding 1.12%, while weakness was obvious amongst the Utilities stocks, an overall gain for the ASX 200 of 7 points or 0.12%. Bellamy’s (BAL) – Profit tripled from last year’s first half numbers, volumes and the addition of Camperdown Powder helped move the needle. The revenue figure came in at $175mil, in line with market expectations but it wasn’t enough with BAL being sold off 5.93% to finish at $14.90. Kogan (KGN) – The online retailer surged today, continuing a stellar 12 months for the company. Sales rose almost 50% to $209.6Mill, about 2% above estimates while the number of active customers also Jumped 40%. KGN finished 18.95% to $8.60. Flight Centre (FLT) – First half profit up 37%, driven mostly by US tax changes, and a lift in guidance helped FLT jump briefly to all-time highs today. The stock finished up 10.37% to $55.26. Nine Entertainment (NEC) – A solid net profit line of $174mil was a great result for Nine today, even if about a third of the figure came from the sale of Willoughby offices. It seems the hit that Nine took in last year’s first half result have helped turn the business around. NEC was the best on ground today, climbing 16.22%. Oz Minerals (OZL) – beat expectations with a profit of $231.1m after tax for 2017 and surprising analysts with a 14c fully franked divided, higher than expected. 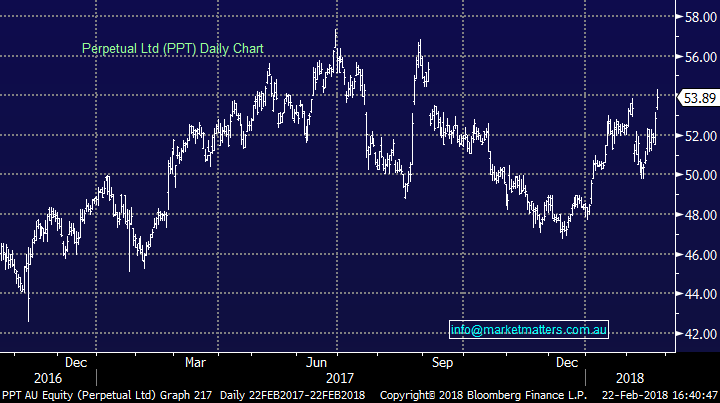 Perpetual (PPT) – reported a net profit of $68.1m lifting its 1H18 dividend up 4% to $1.35/share – this is one underperformer in the funds management space and we bought recently in the income portfolio - PPT closed 1.93% to $53.89. Qantas (QAN) - reported a 1H18 net profit of ~$607m, up 18% from the year prior, beating market consensus. QAN rallied 5.88% to $5.58. Webjet (WEB) - Investors welcomed its 1H18 result with a net profit of $18.4m despite being down 48% a year ago. With WEB re-iterating its FY18 EBITDA target of over $80m inclusive of its JacTravel acquisition costs, WEB rallied 16.04% to $12.01. 1. 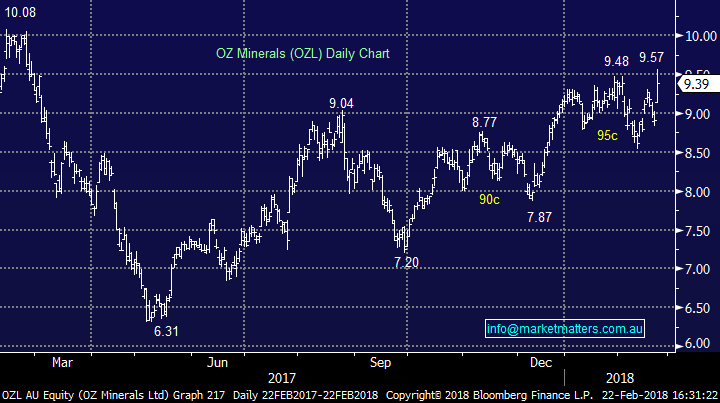 Oz Minerals (OZL) $9.39 / +5.39%; Another solid result from Oz today as they delivered their full year results booking beats on all key financial metrics - Sales, EBITDA (small) EBIT and NPAT. On top of that they delivered a 3rd year of higher copper prodn, extending asset life at existing operations (Prominent Hill) to 2029 – remember just a couple of years ago the market ascribed maybe 5-6 years life + in the background they are working up the Carrapateena project nicely. 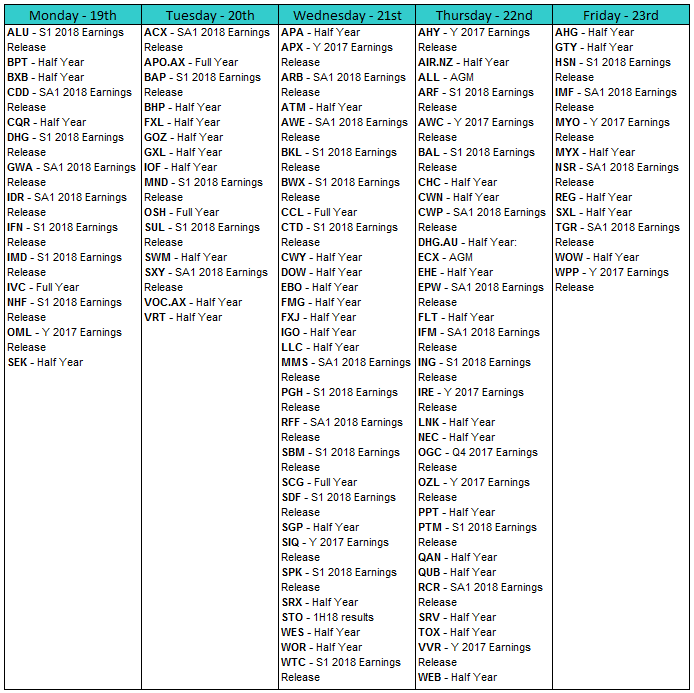 Oz is a company that highlights the amount of money being printed by Aussie miners at the moment – they have almost enough cash at $729m (and NO debt) to cover the capex required to complete the Carrapateena project ($808m) - and that is without talking into account free cash flow over the next 2 years. 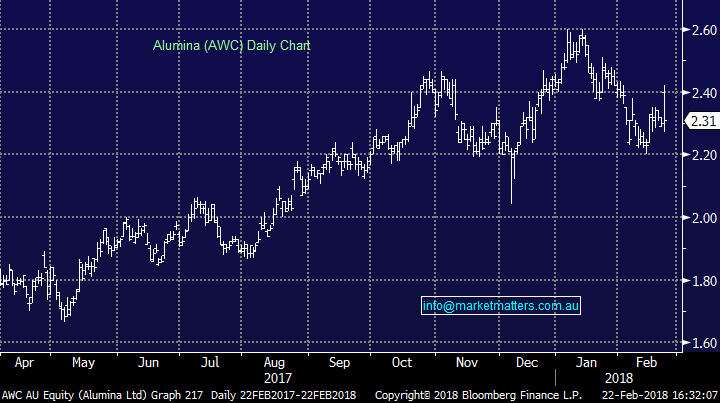 In the not too distant past, the market was concerned that Oz was ex-growth as they would struggle to fund Carapateena and Prominent Hill was supposedly done and dusted around 2023! We own Oz Minerals in the Platinum Portfolio. 2. 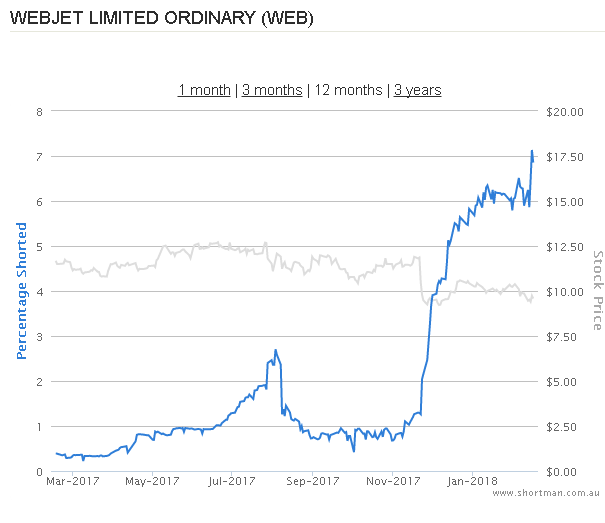 Webjet (WEB) $12.01/ +16.04%; The travel space seems to be hot at the moment with WEB, Flight Centre (FLT) and Qantas (QAN) all reporting strong numbers and rallying hard today. FLT added ~10%, Qantas put on ~6%, WEB up ~15%. The main kicker for WEB today was a significant uplift in revenue plus they guided very strongly. 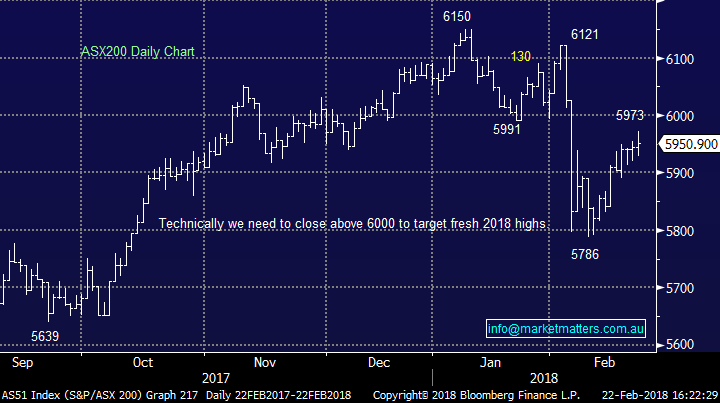 The cherry on the cake being the market positioning around the stock with shorts increasing heavily leading into the result - clearly some decent short covering today however the result was a good one – and shorts got walloped! We own this in the Platinum Portfolio targeting $13.50.